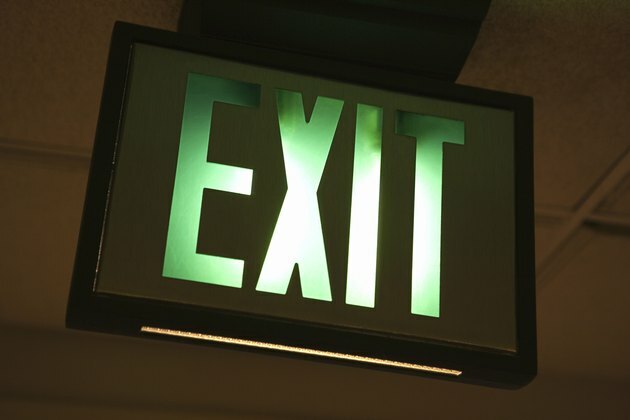 Illuminated exit signs are required by law in many buildings. 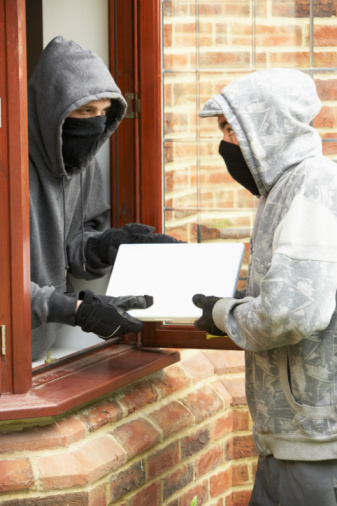 Unfortunately, incandescent bulbs burn out quickly and need to be replaced. Light emitting diode (LED) lamps, on the other hand, last for up to 25 years. They also greatly reduce the exit sign's energy consumption and maintenance costs. In fact, new LED exit signs can save up to 90 percent in energy costs, bringing a return on your investment in just nine months. Turn the power off to the circuit panel to which your sign's AC conductors run and remove the old exit sign from its mounted position. Before unscrewing it from the wall, unscrew the sign's clear front cover to disconnect the AC conductors by either unwrapping them from the hubs or cutting with wire cutters just above where they attach to the hub. If you opt to cut the wires, use wire strippers afterward to clear between one-half to one inch of rubber from the end of the protruding wires. Once the old sign is removed, all wires should remain protruding from the wall. Loosen the cover screws of your new sign and remove the sign's clear cover. Drill holes, about one-quarter-inch in diameter, in the back or sides of the sign enclosure for the AC conduit to enter. String the AC conductors through the drilled hole and mount the sign enclosure onto proper spot on the wall. Exit signs must be placed high so they are out of reach of children and potential tampering. Use the mounting holes located directly under the sign's cover screws. If your sign is an emergency model, make sure that the vent is located in the upper-right-hand corner. Wrap the building's protruding AC conducting wires around the new sign's AC hubs, using the color-coded leads provided and following the instructions in your manual. Pop out or snap in the appropriate directional arrow from the inside of the new sign using a flat-head screw driver. Choose the arrow pointing in the direction of your exit from the mounting spot. Connect the backup battery pack by plugging the battery lead connector onto the charger board (if your exit sign is an emergency model). Test your backup battery by triggering the small switch located on the side or front of the sign (check your new sign's installation manual for exact location). The backup battery, essential to lighting your sign during emergencies and complying with code regulations, should then light the DC-powered bulbs. If it does not light, you will need to replace your backup battery. Replace the clear cover and screw it in place. Restore AC power to your exit sign from the building's circuit panel.